Once upon a time, the hedgehog was the ubiquitous first point of contact for UK citizens and native wildlife. Presently, the once common sight in parks and gardens is now a rare sight, and there are many who have never seen a hedgehog in their lifetime. These small brown mammals with spines and pointed snouts are an underestimated component in contributing to the health of gardens, and ultimately the environment. Check out our infographic below that we have created to help raise awareness of the plight of the Hedgehog in the UK and then read our guide to find out what you can do to help the species recover and begin again to thrive in our country. Hedgehogs have been a part of this world for a long, long time. In fact, evidence has been found of hedgehogs existing even in Ancient Egypt, which was over 3,500 years ago! But the hedgehog that the European continent knows and loves is found everywhere in the UK except some of the Scottish Islands, but they also tend to be scarce in wet areas and pine forests. Mountainous areas are also not very popular with hedgehogs, because their favorite foods are in short supply. Hedgehogs have adapted surprisingly well to living amongst humans. They are able to make use of public and private gardens and any strips of undeveloped land. Everyone certainly knows what hedgehogs look like, even if you have only seen 1 of the 17 different species. The British variant is called Erinaceus Europaeus, by the way. They are small, brown mammals with spikes on their back. Those 25mm long spikes made of keratin (on a full grown hedgehog) are absent from the face, chest, belly, legs, and throat. There are about 5,000 to 7,000 spikes on an average-sized adult hedgehog. Unlike porcupines, a hedgehog’s spikes are hollow and not poisonous. But did you know that hedgehogs also have tiny, stubby tails? And that they are very noisy eaters? Hedgehogs also love to travel, roaming between 1-2 kilometers over night, and will change their area of foraging frequently. This could very well mean that the hedgehog you think is dwelling in your garden is actually an “array,” or group of hedgehogs. However, while this might paint the picture of hedgehogs banding together, these mammals actually live rather solitary, quiet lives. In the summer months, a female hog will produce a litter of around 4-5 hoglets. Unfortunately, the average hedgehog has a very short lifespan of around 2-5 years. With the newly introduced dangers in their environment less are surviving past one year of age. According to a BBC article in 2015, over the past 50 years, two thirds of the native species—both flora and fauna—have declined exponentially in numbers. Hedgehogs, alongside other once flourishing animals, like starlings, sparrows, and frogs, are now considered endangered in the UK. Since 2002, the plight of the hedgehog ravaged over 30% of the total population, and numbers continue to fall. The population as of 2015 was estimated to be under one million. Why the downward trend in the hedgehog population? The main reasons have been connected to the over-management of green space and parks, an increase in paved ground and decks, the use of pesticides killing their food supply, and the fragmentation of territories due to roads and fencing. The list, of course, is much longer than that. But it is not too late to help the hedgehog come back from the brink of extinction in the UK. You have the ability to change the course of their fate. Hedgehogs are often called a “gardener’s best friend” because they eat up snails, slugs and other insects that would hinder plant growth. Worms, beetles, caterpillars, and any invertebrates are fair game. They do no harm to your garden beds or home foundation, like a mole would, nor will they devastate your carrots like rabbits. As mentioned earlier, hedgehogs don’t like wetlands and mountainous areas. They are called “hedgehogs,” for a reason, after all. Hedges, greenery, heaps of compost, garden leaves, under piles of wood—hedgehogs like the forage, breed, sleep, and hibernate in these areas. Sometimes, you might also find a hedgehog hanging out in the garden shed, especially in the cooler months. Once in a while, a hedgehog might camp underneath the dog box or nest beneath decking, too. Naturally, hedgehogs love hedges and gardens because these places usually have abundant food supply. Insects, especially beetles, are a primary source of sustenance. Hedgehogs will follow the line of low-hanging branches, flowers, and other greenery to see what bugs have been attracted; and they will pluck those insects and other invertebrates from the leaves and undergrowth to feast. Hedgehogs create established food routes but are not territorial, so several hedgehogs will often use the same path. Now, we are going to introduce some methods to help you create a welcoming environment for the local hedgehogs. Hopefully, by making your garden a hedgehog haven, you will one day be able to spot these nocturnal wonders in your garden—or at least a sign of them! First, let’s talk about what you shouldn’t give a hedgehog. Never give the friendly neighborhood hedgehog bread or anything milk-based. Hedgehogs are extremely lactose intolerant and can potentially develop a fatal case of diarrhoea. The natural diet includes beetles (the favorite), slugs, snails, caterpillars, millipedes, worms, occasionally frogs, and anything else they rummage up along the way. One of the problems that is threatening hedgehog populations is that the bugs and other natural sources are disappearing due to pesticides and reduced habitat space. That is why you should leave out supplementary treats for hedgehogs to help them get the appropriate amount of nutrition. Avoid putting down slug pellets, because this drives away one of the hedgehog’s favorite meals. Also, don’t put out sugary goodies like cakes and pastries, because the fat, sugar, and other junk ingredients can cause rotten teeth and obesity. Leave bowls of water out alongside the food, especially during the summer months, when liquids might be scarce. A shallow bowl is best. Otherwise, hedgehogs might tip a taller bowl, spilling the water and wasting it. Of course, you might be worried about attracting something other than a hedgehog to your garden, depending on where you live. No one wants cats, badgers and foxes attacking the hedgehog. One option is the setup of a feeding station. Take a plastic storage box and cut a clear hole in the side that is just big enough for the hedgehog to enter. Weigh down the lid with bricks to keep larger animals from knocking off the top and getting inside. If you are worried about rats getting attracted to the food, then don’t put out any grain-based food unless you see the hedgehog nearby. Also, bring in any food that goes uneaten once the hedgehog has come by for a visit. One of the biggest reasons for the decline in the hedgehog population would be the plethora of fenced-in spaces. Hedgehogs are small, and their legs are disproportionately long for their little bodies, helping them travel both near and far. That said, they can’t go bounding over fences like a deer would, nor can they burrow beneath the concrete footers. In order to find enough food, nesting sites, and mates each night, juvenile and adult hogs will travel 1 to 2 kilometers. With fences and spans of pavement preventing them from moving around, they suffer. One way to help hedgehogs is to enable their need to roam. You can get together with your neighbours to discuss creating hedgehog highways. A hedgehog highway is created by cutting a 13cm x 13cm wide hold in your garden fence or digging a channel beneath the garden boundaries to connect your yards (without reducing overall privacy). The hole or pipeline will be small enough to keep other intrusive animals away while allowing uninterrupted passage for hogs. Once you have created holes for hedgehogs to navigate, don’t forget to register it at hedgehogstreet.org. Another way to keep your yard private while allowing hedgehogs to come and go is growing hedges instead of putting up fences with concrete columns. Hedging is the best option for a more natural, clean environment—and is of course the ultimate invitation for hedgehogs! The best species of shrubbery is Handsworth New Silver holly or Teton firethorn. Evergreen hedges, like Emerald Arborvitae, are fast-growing and also provide decent shade. Or, you can choose the Rose of Sharon for a beautiful, flowing hedge. The Royal Horticultural Society (RHS) website has a bounty of information about how to choose hedges fit for your property. While it is tempting to tend to every centimeter of your property and leaving no blade of grass untrimmed, when it comes to hedgehogs and other wildlife, you might want to leave some of it unkempt. Hedgehogs and other creatures will use the fallen leaves, twigs, nettles and dried vegetation to construct their homes and forage for bugs, which will gather underneath the damp and decaying leaves. If possible, gather old bits of wood and some compost. Stack up the logs. Create heaps of compost and dead leaves. This will give the hedgehogs a safe place to hide, sleep, and hibernate throughout the year. The best place for this natural home is a quiet spot in your yard that is unlikely to be disturbed between November and March. During this time, hedgehogs will be using these hiding spots to hibernate. More crafty individuals might want to build homes for their hog visitors. Hedgehog homes are simple and cheap enough to construct, so it might even be a pleasant weekend project with the children or grandchildren. Alternatively there are great Hedgehog houses for sale. Sit back and wait for the hedgehogs to visit. Now, what if you want a shelter that is guaranteed to hold up against the elements? Described below is a design from the British Hedgehog Preservation Society hedgehog home leaflet that is strong enough to protect hedgehogs from the weather and even natural enemies. A single plank 15cm x 2cm untreated timber, about 1.2m long. Don’t forget to make sure the wood you are purchasing is sustainably sourced! Put the tunnel aside and take the wine crate. Using your jig saw, cut an 11cm x 15cm entrance hole into one side of the crate, at the base. Drill a hole that fits the hosepipe into the back of the crate. The hosepipe will serve as ventilation for the house. Put some straw and other dried vegetation inside the box. Put the lid on top of the crate. Do not nail it shut. You will need to be able to remove the lid to clean out the house at least twice a year—once in April and again in October. You have the option of treating the house with a non-toxic waterproof finish or protective coating, but make sure you have some place to let the finish dry. The best non-toxic sealants are tung oil, linseed oil, candelilla wax, and eco-friendly paints like Earthborn or Lakeland Paints. Place the hedgehog fortress in a quiet space in your garden. Top the lid with some heavy rocks or bricks and viola. Remember, the ideal space for a hedgehog is in a quiet spot out of highly trafficked areas. Keep the shelter out of direct sunlight, as it will get hot inside the box, and away from the wind. You also want to make sure the entrance tunnel and ventilation pipe are unobstructed throughout the year, even during winter months when snow and frost can clog it. Once you have linked up your garden to the hedgehog highway and have fabricated a shelter for wandering hogs to hide during the day and throughout winter, it is time to think about what other features you can add to the garden to make it more welcoming to wildlife. One thing you can start doing is looking away from professionally landscape yards and embrace a more “natural” look. Not only are compost heaps and leaf piles attractive beds for hedgehogs to nap, both offer a smorgasbord of creepy crawlies for hogs to feast on. Open air composting is excellent for the environment, too. Just be careful when you decide to tidy up these heaps and piles, because there may be a resident hog or hoglets. Always check for hedgehogs before strimming, mowing, and raking. The seeds and plants you selection will be based on your soil type. Go to a reputable seed distributor, such as Emorsgate, Habitat Aid, or Landlife to ensure you are getting organic seeds of native UK plants. Though ponds can be over the top and rigged with fountains, a simple, small pond is all you need to provide an eye-catching feature that also doubles as an endless supply of water. Plus, since the water will undoubtedly gather insects and amphibians, ponds serve as a secondary location for food. You don’t have to worry about hedgehogs drowning, either, because they are powerful little swimmers. To ensure that they have an easy way out in case they do slip in, though, make sure the edges of the pond are sloping and lined with stones or chicken wire. The hedgehogs can pull themselves out that way. On the off chance that a hedgehog is attacked by a house cat or fox, it can roll up into a defensive ball and use its spikes to protect itself. 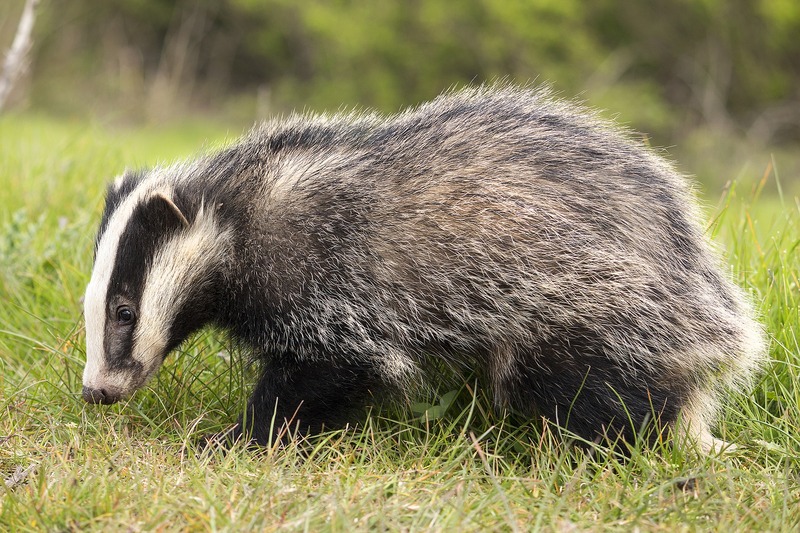 However, there is one creature that is the natural enemy of hedgehogs—the UK badger. Badgers are one of the few predators that are strong enough to uncurl a tightly rolled up hedgehog with their paws. Now that the badger population is on the upswing, more and more hedgehogs are meeting an untimely end. Dogs can also cause injuries to hedgehogs, especially babies and juvenile hogs. Should a dog bite down on a hedgehog, it will wind up with a bleeding tongue or palate; and the hog will probably either die from shock or infection. Large birds, such as magpies and crows, are strong enough and large enough to eat juvenile hedgehogs that risk moving about in the daytime, too. The final natural predator would be maggots, which cause fly strike. Should you see any maggots on a hedgehog, get it medical attention as soon as possible. It will die if left unattended. So far we have covered the foods that are best for hedgehogs, how to give them shelter, and which predators are most dangerous. While lack of proper nourishment, places to hide, and badgers are all common problems that have accelerated the decline in the hedgehog population, there are other dangers in this world that make times hard for the humble hogs. Yes, slugs and snails are disgusting. No one wants them in their garden. Similar feelings are understandable when it comes to crickets, worms, and other insects that damage flowers and crops. Regardless of your feelings towards insects, slugs and snails, you mustn’t rely on slug pellets and pesticides to keep these intrusive creates at bay. Slug pellets are one of the most common causes in premature hedgehog deaths. Should a hedgehog eat a slug that has ingested pellets, it will be fatality poisoned. There are organic pest control options available—including creating a safe environment for hedgehogs—that don’t negatively impact the environment. If hedgehogs are keeping up their end of the bargain and controlling the number of slugs and snails you have in your garden, you can always set out beer traps. While it is lovely that you want to treat the friendly neighbourhood hog to some pastries, please refrain from doing so. Anything with a dairy-based ingredient is potentially poisonous to hedgehogs, for they are lactose intolerant. Stop leaving out bread and milk for hedgehogs and replace those offerings with fresh water and cat biscuits instead. The hedgehogs will thank you for it. The other thing to avoid overdoing is mealworms. While these are much healthier than dairy products, mealworms are the devoid of essential nutrients for hedgehogs. Overeating mealworms actually causes hedgehogs to develop a metabolic bone disease where they lose calcium and their teeth fall out. The same applies to overeating peanuts and sunflower seeds. “Everything in moderation” applies to the hogs too. Though gardening is a pleasurable pastime for many, it can quickly become a horror movie for any unsuspecting wildlife. All too often do veterinarians and animal rescues have to put down hedgehogs that have been injured by gardening tools. Please be sure to check the long grass before using a strimmer. Give hedgehogs and other wildlife a chance to escape. Comb through longer grass first, start with clippers, and then proceed to strimming only when you are absolutely positive no animals are dozing. That pile of logs you might be itching to ignite could also be home to hedgehogs. Before you start the fire, turn the heap over. Another method is to wait until the day of the bonfire to build the heap so that hogs do not make a home out of it. In the event that you do start a bonfire with a hog sleeping beneath the wood, it won’t try to run from the flames. Rather, it will try to curl up into a ball and wind up burning to death. Where squirrels know how to cause massive blackouts, hedgehogs know the art of blocking drainage pipes. While roaming for food, hedgehogs will often investigate uncovered pipes, where they get lodged inside, covered in grime and chemicals, and soon die from hypothermia. Cover all drainage holes and pipes to ensure this doesn’t happen. Keeping all these dangers in mind, you can begin to work to make your property a hedgehog haven. Then, tell your friends and family about how to do the same for their yards. Cut holes in your fences. Add wildflowers and other natural elements. By being just a little more conscious about hedgehogs, you can a world of good. You might have some remaining questions about hedgehogs and how to care for them. Here are some answers to some frequently asked questions. You might want to print out this section and keep it close at hand, just in case you need answers immediately in the future. What do I do if I find a sick hedgehog? Should there be an underweight hedgehog (below 600 grams) wandering around your garden, or active hedgehogs in the winter, first provide these animals with tinned cat or dog food (see food advice) and freshwater. If this is the only thing wrong with the hedgehogs, then you can wait to see what happens. Any other condition—several listed below—that warrants the belief that the hedgehog is sick and in need of immediate care requires contact with the local rescue center. Do not intervene unless absolutely necessary. I found a sunbathing hedgehog. Is that normal? No, it isn’t. Hedgehogs are nocturnal and never sunbathe. If you catch a hedgehog doing this, something is wrong and it is in need of help. Please proceed to give it care. Pick it up with some gloves or a folded towel, place the hedgehog gently in a cat carrier or cardboard box that is padded with a towel or fleece. Keep the hedgehog warm with a covered water bottle, even during hot weather, and provide the animal with adequate food and water. Then, call BHPS (01584-890-801) or a Wildlife Trust for further advice as soon as possible. I found a hedgehog that is walking like its drunk. Is that normal? No, this is never normal. Hedgehogs that are wobbly and drunk are typically hypothermic and in urgent need of help. Please offer the first aid steps described in the answer to question number 1 and call a veterinarian, Wildlife Trust, or the British Hedgehog Preservation Society (BHPS) as soon as possible. What is fly strike and how can I help the hog that has it? Fly strike is a terrible affliction but a common problem with hedgehogs. This problem occurs when an injury on the hedgehog has become infected and is now the breeding ground for maggots. The maggots will continue to bore into the skin and muscles if left untreated. With medication, the hedgehog will not recover. Anytime you spot a hedgehog with white blobs that look like cooked white rice, you are be certain it is affected by fly strike. Get immediate help from a vet. What do I do if I accidentally injure a hedgehog while strimming? This is one of the highest frequency accidents to happen in the garden. In order to prevent this from happening, ALWAYS check the areas thoroughly before strimming, mowing, or even when raking leaves. Usually, when you injure a hedgehog while strimming, the injuries are usually too severe to treat, and the hedgehog will have to be euthanized. In the event you have strimmed a nest, immediately check for hoglets, because it could be a nursery nest. Is it normal to see hedgehogs out in daylight? Not usually, no. Hedgehogs are largely nocturnal, so you will rarely see them out in daylight hours. However, some exceptions to this are when pregnant females are gathering materials for their nests and are putting off sleep in preparation for birth; or the new mum is on break from caring for the hoglets and is getting some food and water before returning to the babies. Another scenario is that the nights are shorter, and you have simply stumbled upon a hungry hedgehog that decided to get the worms with the early birds. You will see these hedgehogs moving quickly and with purpose. Should the hedgehog be acting lethargic while out in the daylight, has flies around it, is acting drunk, or otherwise gives you an impression that something is out of the ordinary, then you should call a local carer or the British Hedgehog Preservation Society (01584-890-801) immediately. Yes, UK hedgehogs do indeed hibernate. Other species may not, however, so don’t let this fool you. The reason UK hedgehogs go into hibernation is because their food sources dry up during the wintertime. Unfortunately, hedgehogs also need to be the appropriate weight of around 600 grams by autumn in order to survive the full duration of hibernation. The hibernation period begins in the colder months, usually around mid-November all the way to mid-March. A random warm day (expected due to the odd weather and climate change) will potentially wake up the hibernating hedgehogs, regardless of the month, and they will start looking for food. Be sure to keep an eye on the weather forecast. If there looks to be an unseasonably warm day ahead, prepare some dry cat or dog food and fresh water outside so the hungry hogs can get some nourishment. Since hedgehogs will hibernate in warm, dry places that don’t frost, be careful when you decide to see some early Spring gardening. You will most likely stumble upon a sleeping hog around compost heaps, bonfire pits, stacked logs, flower and hedge rows, and even inside the shed or underneath the decking. What should I do about my dog not liking the hedgehogs? Unless you want to prevent any further hedgehogs from entering your garden by completely proofing the entire perimeter, you shouldn’t try removing the hedgehogs despite your dog not liking them. Training your dog to leave the hedgehogs alone is the ideal solution, because this works well for everyone involved. If taking your dog out after dark for a run in the garden, make sure that you keep them on a leash, away from leaf piles and other potential hedgehog homes will training. If necessary, use a muzzle and make lots of noise so the hedgehogs can run for cover. Should the situation make doing so impossible, and if you are willing to put in the labor for hedgehog proofing your garden, first contact a local carer or Wildlife Trust so they can relocate the hedgehog and check to see if there is a nest nearby too. Never attempt relocating a wild hedgehog by yourself. Can I take a hedgehog from the wild and put it in my garden? Please, do not pluck a hedgehog from the wild for your garden. Wild hedgehogs cannot simply be uprooted from their homes! While it is wonderful to want a hedgehog for your garden, it will not know the area, food and water sources—and that stress could be harmful. Additionally, you might be separating a mother hedgehog from her babies. Should this mother be unable to return to the nest of needy hoglets, you have just reduced the babies’ chances of survival dramatically. Help! I found squeaking baby hogs? What does this mean? Stumbling upon baby hogs is not unusual, especially if you unearth a nursery nest. That said, it is highly unusual to find hoglets out during the daytime. Should they be simply foraging, this is no cause for alarm. Put out some food and water for them. Yet, should the small hogs start squeaking, this is a sign of distress. Search for mum. If you do not find her, call in a rescue professional, as something unfortunate might have happened to mother. What should I do if I find a dead hedgehog? What you do in this scenario depends on the year. Yes, it sounds weird, but hear us out. In the summertime, you will most likely know whether or not the hog is dead. The signs will be obvious. However, during the winter, you need to be very cautious. Do not do anything unless you know for sure the hog is dead. Otherwise, you might wind up burying the poor thing alive—and no one wants that. In the wintertime, because hedgehogs hibernate, their body temperature drops; so it might just feel cold but is actually fast asleep. You might not even see it breathing. Always contact an expert in your region to verify if the hedgehog is hibernating or dead before doing anything else. I found a bizarre looking hedgehog. What do I do with it? Recently, more and more exotic hedgehogs are being found abandoned in the wild. Sadly, these pets are bred to be human companions and are often unfit to survive in the UK wilderness. An example would be the African pygmy hedgehog, which is a popular pet. When you spot an unusually coloured hedgehog, such as with pale fur, larger ears, big feet, or with other characteristics, you might have seen an exotic species. Take the hedgehog to a specialist or vet to make sure. Albino hedgehogs are rare, so don’t assume that’s the case! Yes, those spikes are sharp and can hurt, but that is not enough of a reason to leave a hurt or sickly hedgehog without care. Hedgehogs do not bite, so you can easily pick up the hurt animal with a pair of gardening gloves, a towel, or another piece of clothing. Alternatively, you can run your hand down its back, smoothing the spikes, so that it rolls into a ball. Allow it to lay sideways so you can rest the hog on your palm without getting spiked. Hedgehogs are very light, even when fully grown. An adult often weighs less than 600 grams. Avoid squeezing the hedgehog. Also, once you have it in hand, try not to drop the poor dear. Place the hog in a cat carrier or cardboard box with high enough sizes so it doesn’t escape. Hedgehogs are master escape artists, after all. Once you have the hog in a safe place, put the carrier or box in a cool, quiet location while you receive professional advice from the British Hedgehog Preservation Society or an affiliate. You can also call or email a Wildlife Trust to help. And, if you find that you can’t catch the sickly hedgehog to get care for it, don’t hesitate to report the sighting to a Wildlife Trust or a volunteer from BHPS to come so the hog can receive appropriate veterinary attention. Hedgehogs might be vanishing at an alarming rate from the UK, but you have the power to change their fate. It is sad that many children have yet to see a hedgehog in the wild, yet there might come a time in the future when hedgehogs are thriving in gardens around the UK again. By following the tips and tricks in this ultimate guide to hedgehogs, you can build a garden that welcomes these delightful creatures. And if you cannot physically help, you can always donate to a wildlife rescue or trust to aid in the effort to bring the hedgehog back from the brink of extinction in the UK.